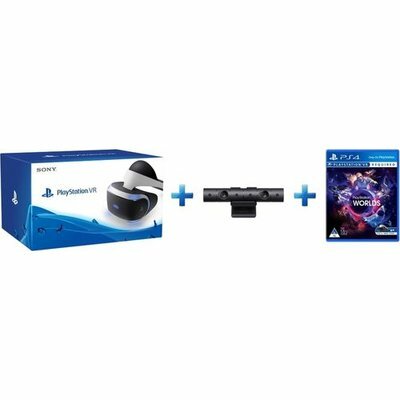 Please note: you’ll need a PS4 system and a PlayStation Camera to enjoy PS VR. PS4, DUALSHOCK 4 wireless controller and the PlayStation Camera are all sold separately. - Integral to PlayStationVR The PlayStationCamera is required for PlayStationVR and helps immerse you in enthralling virtual spaces. With dual lenses and 3D depth-sensing technology, the camera is able to accurately track every movement of the VR headset, DUALSHOCK4 wireless controller or PlayStationMove motion controller to give you an incredible sense of presence in virtual worlds. - Includes new adaptable stand Bend the stand into position so that it sits perfectly above or in front of your TV. - Star in your own video broadcasts Capture picture-in-picture video of yourself and your gameplay action and livestream it straight to YouTube, Dailymotion or Twitch. You can also edit your broadcasts with commentaries, soundtracks and visual effects in SHAREfactory. - More ways to control your PS4 Log in using facial recognition and control your PS4 by speaking to it using voice commands. Integral to PlayStationVR The PlayStationCamera is required for PlayStationVR and helps immerse you in enthralling virtual spaces. With dual lenses and 3D depth-sensing technology, the camera is able to accurately track every movement of the VR headset, DUALSHOCK4 wireless controller or PlayStationMove motion controller to give you an incredible sense of presence in virtual worlds. Includes new adaptable stand Bend the stand into position so that it sits perfectly above or in front of your TV. Star in your own video broadcasts Capture picture-in-picture video of yourself and your gameplay action and livestream it straight to YouTube, Dailymotion or Twitch. You can also edit your broadcasts with commentaries, soundtracks and visual effects in SHAREfactory. More ways to control your PS4 Log in using facial recognition and control your PS4 by speaking to it using voice commands.